for Z!, Amsterdam magazine for the homeless. 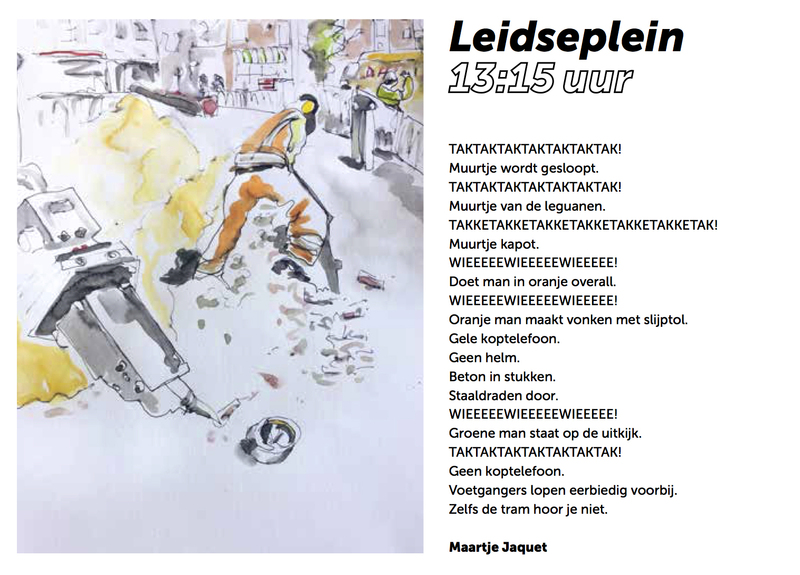 Every three weeks, an impression in image and words of a place and time, somewhere in the city of Amsterdam. A variable mixture of prose and (concrete) poetry, depending on the situation. My poems are in Dutch but I translate many of them into English. Some of them can be found on my blog ‘kijkschrijver – eye write‘ and / or in this online album on flickr. Forty miniature poems by twenty poets (in Dutch), written for the Miniature Poetry Festival in Laren 2017. If you turn this 10 x 10 cm booklet you can read The philosophers debate ‘Amforisms’, a philosophical conversation between the young and the old philosopher. 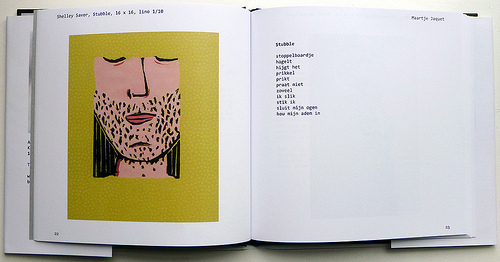 Book with CD, self-published, bound and numbered (300 copies), 2014. Collaboration with Patricia van de Camp (photography), Maartje Jaquet (poetry),Kein Angst (music) and Ellen Tolboom (lay out). Price: € 15,-, shipping excluded. Photos and poems can be seen and read here, too, in Dutch or in English. Over de liefde (Matters of the heart). Photography and poetry (Dutch and English). 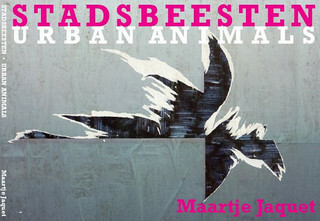 Maartje Jaquet, Amsterdam, ISBN 978-90-816161-1-9. Made possible with support of the Amsterdam Art Fund. Poëzie enzo … Kunst en Poëzie in Atelier Open. (Poetry and such … Art and Poetry in Atelier Open). Pages 19, 21, 23 (poetry to linocuts by Canadian artist Shelley Savor). *) Lately, I started writing poems without a visual reference, from scratch. I haven’t put them online as of yet, only on my personal Facebook page. If you happen to be a friend on Facebook you might have come across one or more of them.